Season pork on both sides with garlic pepper. Melt butter in large skillet; add pork and cook about 4 to 5 minutes on each side or until completely done and browned. 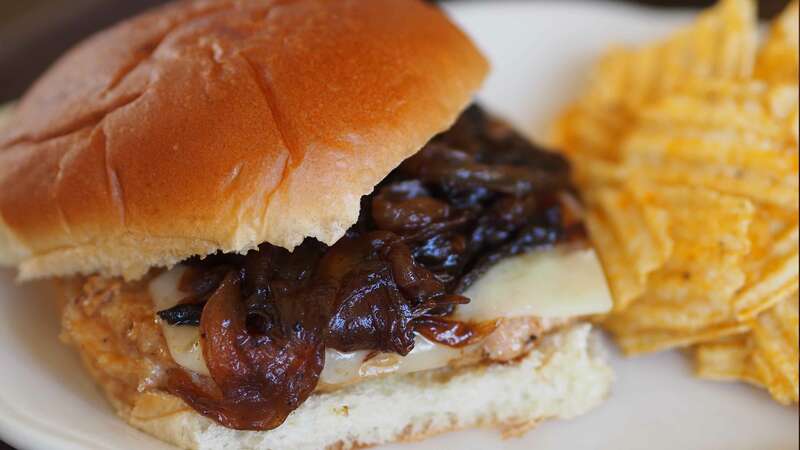 Serve on buns topped with caramelized onions and Swiss cheese. Heat butter and oil in heavy, large skillet. Add onions and brown sugar. Cook slowly over medium heat, stirring occasionally, until onions are a rich golden brown, about 20 to 25 minutes. *Cubed pork steak is made by pounding a pork cutlet with a meat tenderizer or a specialized cubing tenderizer. The result leaves cube-shaped indentations on the meat's surface and makes the meat more tender.